WBC & Microsoft Store Recently Awarded Entrepreneurs in the InnovateHER 2016 Challenge! The University of Hartford’s Women’s Business Center (WBC) and the the Microsoft Store at Westfarms hosted local InnovateHER challenges aimed at discovering innovative products and services that positively impact the lives of women and families. Gloria Kolb of Elidah, LLC won the challenge at the WBC and Ashley Stone of Beauty Entourage won the challenge at the Microsoft store. Gloria Kolb of Elidah, LLC in Monroe, CT won the WBC’s challenge with a plan to develop and market a device that offers a discreet, comfortable, and convenient treatment for stress urinary incontinence (SUI), a problem that affects 1 in 3 women in the US. Although a very private concern, SUI has far-reaching physical, social, and economic implications, with costs to the US healthcare system approaching $25 billion. Elidah’s non-surgical, wearable therapeutic device will improve the quality of life and reduce the need for surgery for many women. Ashley Stone of Beauty Entourage in Farmington, CT won the challenge at the Microsoft store with an app that will soon be available through her mobile hair and makeup business. Beauty Entourage provides a convenient, time-saving and stress-free experience for women by bringing the best hair stylists, makeup artists, and more right to their door step and offering virtual consultations. Ms. Stone is a client of the WBC. She plans to open additional locations in Boston and New York. The WBC hosted this challenge as part of a larger national competition run by the US Small Business Administration (SBA) in collaboration with Microsoft. The aim of the competition is to identify products and services nationwide that have a measurable impact on the lives of women and families, have the potential for commercialization, and fill a need in the marketplace. Kolb and Stone will now advance to the semi-final round, hosted by the SBA, where ten national finalists will be chosen to compete in Washington DC in March 2016 for $70,000 in prizes. • W2 Designs, LLC, South Glastonbury, CT, with Willow Workout, a versatile freeform exercise device that offers unlimited low-impact strength and flexibility workouts with targeted results. The Women’s Business Center (WBC) is an initiative of the University of Hartford’s Entrepreneurial Center (EC), which provides hands-on coaching and business training for new and expanding small businesses, as well as aspiring entrepreneurs, throughout Connecticut. Part of the nationally-renowned Barney School of Business, the EC helps small business owners and employees to gain the business skills needed to succeed in the marketplace through business advising, technical assistance, educational programs, and networking events. The WBC specializes in serving women in business. For more information, visit www.hartford.edu/wbc. 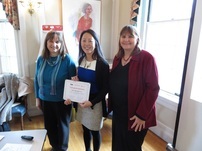 Photo Caption: Sandra Cahill, Entrepreneurial Center Director (left) and Milena Erwin, Women’s Business Center Program Manager, (right) announce Gloria Kolb of Elidah, LLC (center) as winner of the Local InnovateHER Challenge.